Brand24 enables you to have an accurate insight into reactions across social media to current events and affairs in a real time. This means that you can measure the total number of mentions and its changes, study contents and the sentiment of opinions, identify sources and authors that create buzz about the brand or specific event. We have prepared plenty of reports which can help stakeholders with a greater understanding of people’s reactions in social media. Those reports are based on the analyses of data gathered from the Internet monitoring and concerns distinct events, announcement, brands etc., which influenced on the social media buzz. 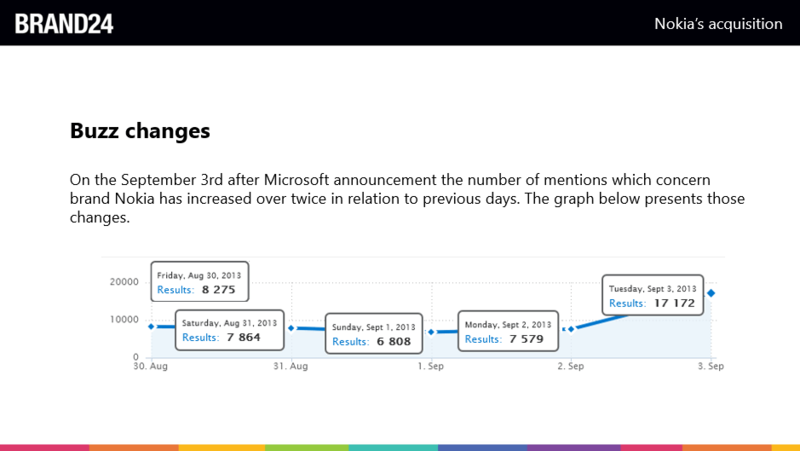 So far, we have analyzed contents related to numerous trending events, popular products, updates, such as Superbowl 2015, World Cup 2014, the Witcher III, Star Wars, Game of Thrones, smartwatches, Oscars, GoPro Hero 4, Slingshot introduction, Snapchat update, iPhone 5, Nokia Lumia 1020 release, Web Summit in Dublin, Seene introduction, GoPro Hero 3+ announcement and many more. All of these reports not only give you the understanding of a problem, but also some potential solutions. Number of mentions is an essential element, which shows how specific event engages social media authors. Sentiment of opinions – crucial feature, which show an image of a brand in the Internet. Sources and information about the authors – you can divide all mentions into categories based on the sources where the mention was found. What is more, you can also have a complete information about all the authors that talked about the specific event or brand in the Internet. You can learn about their activity, influence and reach in social media. Contents’ categories – thanks to Brand24 it is possible to distinguish different contents’ categories related to specific phrase and you can find out what exactly social media authors write about a topic. It is not always the quantity but also the quality of mentions that counts. In our analyses usually positive comments exceed the negative ones. People are rather content with a new product implementation or update to a current one. But some controversial events may affect negative moods on social media. Those opinions reflect the brand image in the Web. Therefore detecting them in advance may help in improving the perception of a company on the Internet, as nowadays social media plays a crucial role in setting trends. 1. Detecting the most popular source of mentions about the specific event or brand is an important information when you want to implement your PR activities on the Internet. Nowadays interactions with your current and potential customers in the web may improve your image and extend target group. Therefore, when you know the most popular places on the Internet, where people write about your company you can focus only on one or a few communication platforms. 2. 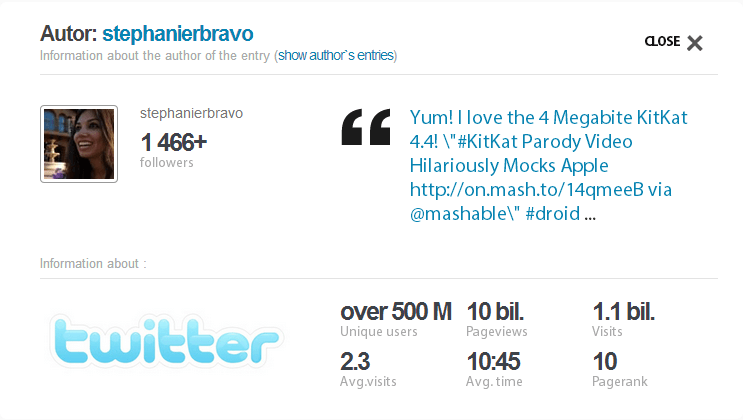 Brand24 gives you an insight into profiles of people who write about your brand. You can detect the most active and influential ones, who can become your brand ambassadors. 1. The majority of mentions about the brand usually concern current events related to it. For instance, after T-Mobile unveiled unlimited international data over 60% comments referred to the announcement. 2. Usually the biggest part of all mentions concerns only about 2-3 subtopics. 3. Results from Brand24 monitoring may help to detect dissatisfied clients who are willing to resign from your company’s services and also to estimate the number of discontent customers. 4. Monitoring may also help to estimate the number of potential customers who are willing to leave the competition. 5. In our reports we also study brand perception.